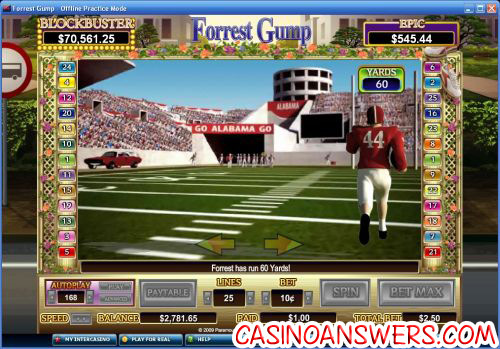 Forrest Gump Video Slot Guide & Review - Casino Answers! 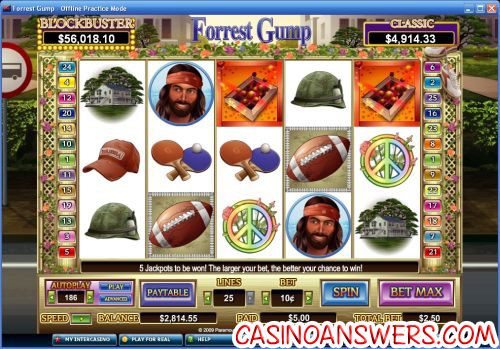 If you thought they had run out of ideas for new slot machine games, now you can play a video slot based on the Hollywood movie Forrest Gump at InterCasino. The Forrest Gump video slot opens with a video cutscene with clips from the very memorable 1994 film that starred Tom Hanks. It’s a 5-reel, 25-line video slot. It has two features – Box of Chocolates free spins and a Run Forrest Run bonus game. Forrest Gump also has five different progressive jackpots.Play at this years #1 online casino for United States - Slots.LV. Forrest Gump has randomly won 5 Progressive Jackpots. These are Smash, Epic, Classic, Acclaimed and Blockbuster. Each successive jackpot listed is greater than the previous one. For an example, at the time of this writing, the Blockbuster Progressive Jackpot is currently at $120,582.36. The jackpot certainly lives up to its name. In the Hollywood Jackpot game, you can make up to four selections to reveal film reels and move up the jackpot ladder. The Gold, Silver and Bronze reels award 10, 5 and 3 points. The more points you have, the higher jackpot you have a chance to win. If you move up a new jackpot level, the selection area will be reset and you have four new selections to make. You cannot win these jackpots during free games. If you receive three Box of Chocolate scatter symbols on any played lines on a spin, you will unlock the Box of Chocolates free spins. Automatically, you are given five free spins and you must pick the right boxes of chocolates to win more free spins. There are nine boxes of chocolates to choose from. With two different features, great cutscenes and sound clips straight out of the movie, Forrest Gump will make for an excellent gaming experience for any fan of the movie. Not only is it a lot of fun, but there are lots of chances to win big! Try it out at InterCasino! Does the Forrest Gump slot machine have any progressive jackpots? It has five! They are (in order) the Smash Jackpot, Epic Jackpot, Classic Jackpot, Acclaimed Jackpot and Blockbuster Jackpot. The jackpots are awarded randomly – you don’t even need to match any symbols to win! However, the more you bet, the more you will increase your chances of winning the jackpot. Is there really a Forrest Gump slot machine? What movie slot machine games are there?